Divisiveness and alienation undermine wisdom-generating capacity. Social capital is the resource of human connection. Bonding capital exists within a group and bridging capital exists between groups. 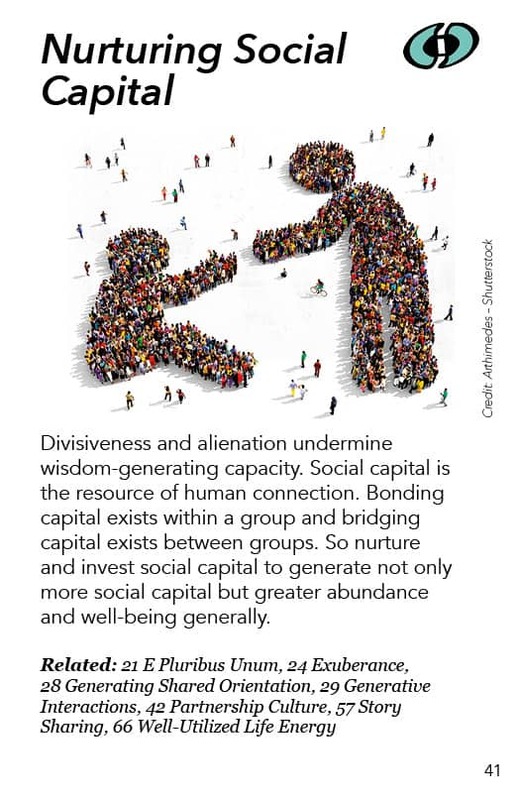 So nurture and invest social capital to generate not only more social capital but greater abundance and well-being generally. This comes from a larger inquiry in economic theory about the nature of capital. Capital is some kind of resource that you can invest, you can plow into the activities of life in order to get more of something back, either that same kind of capital or something else. So money is usually what people think capital is, since you can invest money to get more money. That’s what’s known as “financial capital.” But many other kinds of capital are not as broadly recognized: natural capital, built capital (e.g., factories and roads), intellectual capital, human capital, social capital, etc. Human capital is about individual human capacities, while social capital is specifically about relationships. So here we’re focusing on social capital. What we want in a thriving democracy is good connection within groups. We want strong groups and associations, and we want people who are in those groups and associations to be able to relate to other people in other groups and associations. So in the community as a whole people are connected with each other and – depending on what’s going on – people can act in their group or between the groups. If there’s a major natural catastrophe or some economic hardship, a major factory leaves or whatever, you want the people involved to be able to come together across various ideological views, interests, and various social and cultural boundaries. The more you can invest in social capital, the more you are able to be resilient as a community and to generate collective intelligence and wisdom. If people generally don’t like each other, don’t relate to each other, stay in their own little spaces socially and physically, then it’s kind of hard to generate collective wisdom for use by the larger community or society. So social capital is one of the things to invest in in order to have the capacity to generate more collective wisdom and intelligence. The more social capital you have the more people can work together to create greater abundance and well-being. I think the word social capital is a handy little tool and it is very easy to relate to. If you have very low social capital you end up creating the conditions for social upheaval. People across races, across police systems, across religions, across all classes are battling it out. You have revolutionaries and the basis for war. These societies just get torn apart about religious or cultural or clan differences. Really horrible things have happened along those lines, and they provide examples of how low social capital can go. The people – politicians and other power holders – who nurture divisiveness and alienation are in fact reducing their society’s social capital. They are draining social money out of the bank of connectedness. Interracial and interfaith initiatives, and lots of community celebrations, street fairs, sports, etc., as well as inter-group activities and associations. Examples are various interracial, interfaith, and intercultural initiatives. Commons Café, a kind of World Cafe where you consciously recruit some very different people – for example, 10 people from a black church, and 10 people from a country club, and 10 homeless people, and 10 soccer moms. You set up a bunch 10 tables with four chairs at them with a bunch of cards with questions about ordinary life in the middle of each table. The chairs are color-coded so all the soccer moms go to chairs that are grey, and all the homeless people go to chairs that are red, etc. They have little colored cards stuck to them. Each table has all these kinds of people present together and then they turn over one of the cards and everybody answers what’s on the card. So, “What do you know a lot about?” might be on the card. Suddenly the country club guy discovers the homeless guy is actually a PhD in Shakespeare or something like that. That blows apart the stereotypes. From examples I have heard, people come back after a half-dozen sessions of Commons Cafe and don’t want to stop. They’ve gotten friendships formed. This is a very conscious approach to bridging capital. Of course, community celebrations of all kinds nurture social capital, street fairs and whatever, where people come out as part of the community rather than as part of their group. Instead of going to church you have an interfaith celebration or just a celebration of being proud and happy as a community. And all kinds of things within groups, groups do their own things. You don’t have to organize that, but that function in society is building the bonding capital, the in-group togetherness.